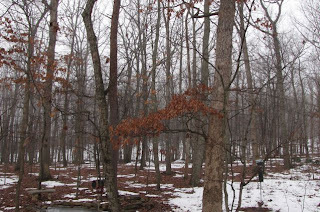 Have you ever looked at a winter forest and noticed a few trees that seem to be holding on to their dead leaves? The forest behind us is mostly oak and oaks are known for doing this. Although there are hundreds of trees behind us, only a few are holding on to their leaves. What is God showing us in this pattern? One cold winter day I was looking out at the bleak appearance of the forest. I so miss the leaves and the dense growth of the other three seasons. You might think that the trees that are holding on to their leaves provide a better view of what I long for, but dead brown leaves do not light up my heart with the image of life. The forest harbors and fosters all sorts of critters, creatures and creepy crawlers, but in winter, it looks so seemingly dead. We tend to feel dead in the winter of our lives. We go through tremendous pain and horrendous trials and if we're not careful we'll hold on to those events long after we should've released them, like dead leaves. Sometimes we don't process through them well. When Israel left Egypt it didn't take long for them to grumble about their road trip, and that grumbling spirit remained with them. That generation never seemed to look at the promises of God ... they were always looking at the current circumstances that led the way to the promises. A trip that would've taken 11 days took 40 years. Do we extend our wilderness time by hanging on to the dead stuff in our lives rather than focusing on Life and Truth that the Word offers us? When Moses sent men in to search out the Promised Land and bring back fruit, it took 40 days. Two men came back with a good report (Joshua and Caleb) and the others were fearful. Take note that you can't grumble and gripe and be faith-filled; it will only enhance the level of fear in your life. When you speak your feelings, rather than what God says about things, you will always find fear. Without faith it is impossible to please God (Hebrews 11:6). So, Israel stayed in the wilderness for 40 years, one day for each day they searched out the Promised Land. We all have promises of God. Close your eyes and ask the Holy Spirit to bring to mind the promises God has given you. You know them in your heart ... but your heart may not be ruling your life in these troubled seasons. Often our mind takes over and we think too much and when we allow the mind to rule, we won't be walking in faith. The mind will consider all options and possibilities, with the very limited realm of the physical world. God is totally supernatural, so we cannot reason the results that God has for us, if we allow our minds to rule through the wilderness journeys of our lives. There's a lot of self-help stuff out there, but the most we can get from it is to stir up our flesh to be strong, determined and tenacious! To believe that WE CAN do all things, but the actual power of that promise is that it's .... "through Christ who strengthens me" (Phil. 4:13). There have been many seasons in my life where I quoted that scripture, but was not operating in Christ's strength. It was all Donna's flesh. Sometimes what we consider to be strength, determination and tenacity is looked upon by God as stubborn, stiff-necked and rebellious. Those oak trees that hang on to their dead leaves remind me that often I hang on to dead things in my soul (mind, will and emotions) that serve no true purpose or promise for the direction God is taking me. I may still be 'hanging on' but where is the fruit in that area of my life? If I don't rise above the trial with what the Word says, then I will wallow there much longer than necessary. 11 days or 40 years? Many times using our own strength in these battles delays deliverance. Have you given up on God's promises because you didn't see them by working with your own flesh? The flesh profits nothing. It's our heart dedicated to God that brings life into us. We have to look up out of the circumstances to bring life back into our lives. Let go of all those dead leaves that are still hanging on to "the old" and stretch out your arms for new growth and life in His Word. Only the Bible will bring life. It is the only manual for success that will ever work. There's a lot of good books out there and I love to read what others have to say about God and a faith walk, but if we don't spend as much time in The Word as we do in other materials, we will surely not find our way out of problems and troubles. "So shall my word be that goeth forth out of my mouth: it shall not return unto me void, but it shall accomplish that which I please, and it shall prosper in the thing whereto I sent it" (Isaiah 55:11). All that God speaks to us in His Word has power and life and as we speak it and meditate on it, it brings life and light into our dearkness. Get rid of the dead and produce new life in your tomorrows!